NASHVILLE — Early voting begins Friday in Tennessee for Aug. 2 state and federal primary contests, as well as county general elections. And if history is any guide, as many as half, if not more, of all votes will be cast before Election Day arrives. For the first time in 18 years, voters will decide in Republican and Democratic primaries who their party standard bearers will be in open governor and U.S. Senate contests. Incumbent Republican Gov. Bill Haslam is restricted by term limits, while Republican Sen. Bob Corker of Chattanooga is retiring after two terms. Also up for voter consideration are all nine U.S. House seats, with three vacancies in districts centered around Knoxville, Franklin and Gallatin as two Republican incumbents run for governor and U.S. Senate. And in the Republican-dominated Tennessee General Assembly, all 99 state House seats are up, while 17 of the 33 state Senate seats are up for grabs as well. In Hamilton County alone, there are three House districts with no incumbent. This is also the general election in Tennessee's 95 counties for offices including mayor, sheriff and county commissioner. 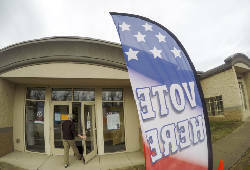 Add them all up and Tennessee Secretary of State Tre Hargett predicts that "at least half" of Tennesseans' votes will come during the two-week voting early period. "I think we know we have spirited Republican and Democrat primaries in the governor's race," said Hargett. "And so I think that will certainly contribute to a greater turnout. I think there's a lot of interest here in Tennessee." However, Hargett shies away with making predictions about how many of Tennessee's 3.95 million voters will actually show up this year. Republicans have a rollicking GOP gubernatorial primary featuring four major candidates now spending millions of dollars on television. And for the first time in years, Democrats are making their first serious play for the governor's mansion with two well-known candidates. Early voting extends from Friday through July 28, excluding Sundays. Back in 2010, the last time there was no sitting governor running for re-election, 48.68 percent of Tennesseans either voted early or by absentee ballot in state primary elections. In 2016, with no major statewide contests in August, just about 51 percent of voters cast ballots early or voted absentee. As of June 30, major candidates running for governor had spent $37.2 million on their campaigns, according to the four major Republicans' and two leading Democrats' campaign financial disclosures. The Republicans are U.S. Rep. Diane Black, a Gallatin congresswoman; Knoxville entrepreneur and former state economic development commissioner Randy Boyd; Tennessee House Speaker Beth Harwell of Nashville and Nashville businessman Bill Lee. Black and Boyd, the frontrunners in the GOP gubernatorial primary according to recent polls, are spending heavily on television ads, most recently on attack ads, while Harwell and Lee have largely avoided harshly criticizing the others. Most Republican candidates are touting their support of President Donald Trump, while Black has also sought to inject any number of federal hot-button issues, such as illegal immigration, into the campaign. In stark contrast to 2014, when the surprise Democratic nominee for governor was a man with a famous name but no money — Charlie Brown — this go-around, former Nashville Mayor Karl Dean and state House Minority Leader Craig Fitzhugh of Ripley are seeking their party's nomination. While Fitzhugh has criticized Dean publicly, a lack of resources has kept him from hitting his message hard on television. The better-financed Dean, meanwhile, is running positive ads. Corker's retirement has drawn U.S. Senate hopefuls Republican Marsha Blackburn and former Democratic Gov. Phil Bredesen into a race with national implications as they seek to replace him. They face relatively little-known opposition in their primaries, although Chattanoogans may remember local attorney John Wolfe, a perennial candidate who is running against Bredesen in the Democratic primary. While Blackburn and Bredesen's contest isn't until the Nov. 6 general election, that hasn't stopped the candidates from engaging in a scrap that could determine control of the narrowly GOP-led U.S. Senate. That's already drawn intense national interest. Meanwhile, departures by three congressional Republicans — a retiring U.S. Rep. John Duncan in Tennessee's Second Congressional District, Black who is leaving her 6th Congressional District seat to run for governor, and Blackburn, the Brentwood congresswoman giving up her 7th Congressional District seat to run for the U.S. Senate, have led to spirited contests in the 2nd and 6th districts. Closer to home, incumbent U.S. Rep. Chuck Fleischmann, an Ooltewah Republican, faces GOP primary opposition from Jeremy Massengale of Ooltewah, Harold E. Shevlin of Cleveland and William Spurlock of Chattanooga. Democratic challenger Dr. Danielle Mitchell of Hixson is running unopposed in her primary and will face the winner in November. Over in the state's 4th Congressional District, incumbent Republican U.S. Rep. Scott DesJarlais of South Pittsburg faces GOP primary opposition from Jack Maddux of Cleveland. Democrats running are Christopher Hale, Steven Reynolds and Mariah Phillips, all of Murfreesboro. There are a number of local legislative contests, as well as a pending lawsuit in one of them. State Rep. Gerald McCormick, R-Chattanooga, recently announced he would not run for re-election and would step down soon from his House District 26 seat, opening it up for new entrants. Former Tennessee Republican Party Chairman Robin Smith of Hixson qualified to replace him on the ballot in the race, where she would face Democrat David Jones of Chattanooga. While another Democrat, Jean-Marie Lawrence, remains on the ballot, she has withdrawn. But the Tennessee Democratic Party has sued in an effort to keep Smith off the ballot. That case is pending in a Nashville court. Local contested legislative seats up in the August primaries include five Democrats running in their House District 28 primary to replace retiring incumbent Rep. JoAnne Favors, D-Chattanooga. They are Jackie Anderson Thomas, Dennis Clark, former Chattanooga city councilman Yusuf Hakeem, Brandon Woodruff and Melody Shekari. The winner would face Republican Lemon C. Williams Jr. in November. Meanwhile, Republicans Esther Helton and Jonathan Mason are battling in the House District 30 GOP primary to replace incumbent Rep. Marc Gravitt, R-East Ridge. The winner will face Democrat Joda Thongnopnua in the general election. Staff writer Judy Walton contributed to this story.